"Oh, I've had some fun ones," said Linda Lea Viken, president-elect of the 1,600-member group. "It's very, very common in my new cases." "Programmable Matter Takes Shape with Self-Folding Origami Sheets". I'm sure nothing could possibly go wrong with this technology! Researchers design more reliable invisibility cloak. "FAQ: The iPhone 4 antenna flap"
I don't think I'd want to be treated for a brain disorder in this medical office building. "Italian Scientists Who Failed To Predict Quake Indicted For Manslaughter". Fixing iPhone4 reception problems with a 1/2-cent strip of electrical tape. This is, of course, much cheaper than buying Apple's $30 "bumper case". "Quantum Entanglement Holds DNA Together, Say Physicists"
"Daily Mail runs iPhone 4 recall story based on fake Steve Jobs tweet". Two more advances in quantum computing. Detailed analysis of the iPhone 4 antenna issues. "iPhone 4 Loses Reception When Antenna Band is Touched: Firmware Issue?" Wall Street Journal: "'I Hate My Room,' The Traveler Tweeted. Ka-Boom! An Upgrade!" Flowchart of the day: "Is Twitter down during the World Cup?" 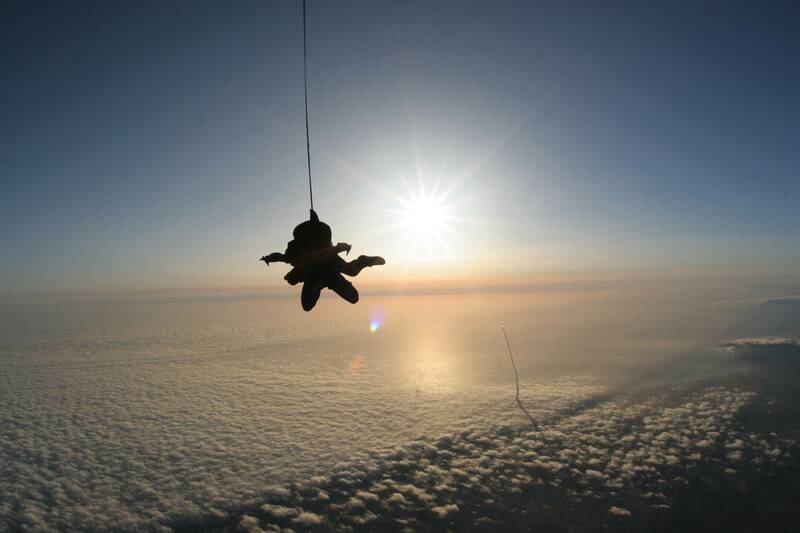 Update on the earlier photo of the skydiver watching the rocket launch. According to a regular GeekPress reader, it's the June 7 liftoff of the Delta 2 rocket from Vandenberg Air Force Base, not the space shuttle. Thanks for helping to set the record straight! Off topic: If you're a supporter of free speech rights, then you'll want to check out the new blog from the Institute for Justice, "Congress Shall Make No Law". "iPhone 4 Takes You on a Fantastic Voyage Through a Virtual Colon"
Toshiba dual-screen, er... um... tablet? Or e-reader? Or ultra-mobile PC? "How much do street prostitutes earn?" "Can brainwaves be detected in lime Jell-O?" Ars Technica has a detailed review of Apple's iOS4. Best cease-and-desist letter: National Pork Board threatens ThinkGeek for fake unicorn meat ad that calls unicorn "the new white meat". "Illinois court sets standard for unmasking anonymous commenters"
The software that keeps Facebook running. "Depressed student goes off his meds, attacks some Hell's Angels with a puppy, and then escapes on a stolen bulldozer. Both student and puppy are safe in custody." No, really. There are other nuggets among the recordings, such as a portion of a high school basketball game believed to be the second oldest surviving sports broadcast and the earliest known recording of the famous NBC chimes. In one of the recordings, Edison spoke about the creation of the incandescent light bulb on its 50th anniversary. Video of the day: Star Trek (TOS)/Kesha "Tik Tok" mashup. Excellent visuals. For those who are interested, here's the original. "iPhone 4 Has More RAM Than iPad"
"The genius of Facebook & Twitter: reply-optional"
Get ready for more Twitter "fail whale". Twitter is saying they can't handle the traffic related to the World Cup. Dating website to match up Apple fanboys/fangirls. Visualizing insect flight with smoke and mesh. "Why Starbucks is smart to offer free internet access". On the other hand, Jeff Bertolucci of PC World thinks it will just attract WiFi squatters. "Human Genome Project; Flat Part of the Exponential Curve; Unstable Equilibrium". Can devices be powered using ambient radiation from existing broadcasts? Twittiquette lesson of the day: MT vs. RT vs. PRT vs. "via". "The Little Feature That Led to AT&T's iPad Security Breach"
It's a clever solution to a very real and obvious problem, however. The bridge is part of a proposal by NL Architects to connect Hong Kong with mainland China. To do that, they had to solve a problem: In Hong Kong, people drive on the left side of the road. In mainland China, they drive on the right side. 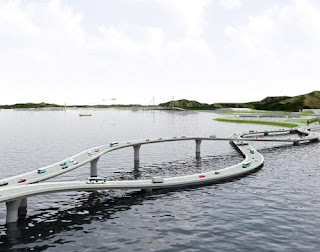 Here's the solution: A road flipper that physically twists the roads over each other. Video of the day: "BP Spills Coffee"
Update: Kendall at The Crucible explains why the video is not funny. Nine puzzles of space and time. Off topic: PajamasMedia has just published my latest OpEd, "Free Speech: Use It or Lose It". How Android, Chrome, and the iPad are shielding us from malware. "AT&T Learns Exactly The Wrong Thing About Data Usage"
Why experienced car thieves like The Club. More from Rand Simberg at AOL News: "SpaceX Launch Shows Promise of Private Space Travel". How to spot a CIA officer. Massively inappropriate magazine cover of the day. Rand Simberg: "One Giant Leap For Commercial Space". What AT&T's Limited Data Plans Mean for You"
Crocs sandals save boy from severe electrical shock. (You can click on the image to see it full size). "How iTunes Genius Really Works"
I, for one, welcome our replicating robot overlords! The Hobbit movie is apparently delayed because of problems at MGM studio corporate level. Plus director Guillermo del Toro has reportedly quit over this issue. Off topic: The May 31, 2010 PajamasMedia has just published my latest OpEd, "Beware Dr. Galbraith's Snake Oil". My theme is that even in the face of the Greek situation, some economists continue to argue that deficits don't matter. Video of the day: "8 month old hears for first time as cochlear implant is turned on"